Now that the weather is warming up, I find myself making “party foods” so much more. 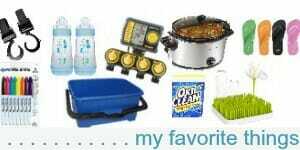 And by “party foods” I mean foods I would normally make for bigger groups of people, cook-outs, backyard BBQ’s, etc. 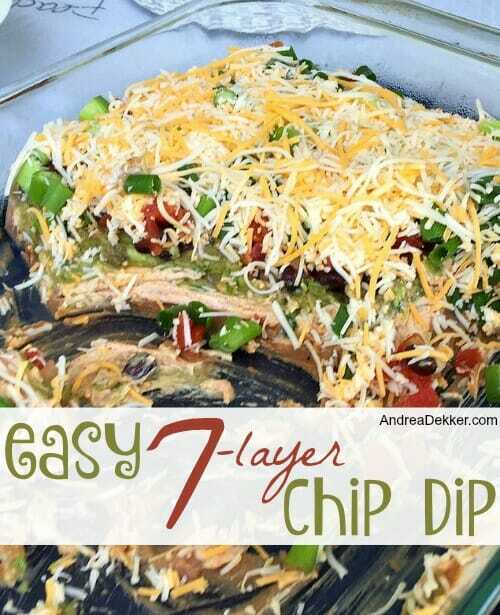 One of my favorite, super easy party foods is the 7-layer chip dip I shared on the blog 2 years ago. It’s AMAZINGLY delicious, super simple to prepare, and it can easily be made a day in advance for those of you who like to plan ahead! 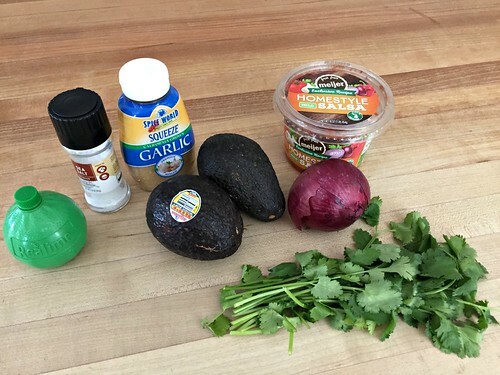 One of the 7 layers of this dip is a super simple guacamole layer — it’s the recipe I use whenever I want to make homemade guacamole. 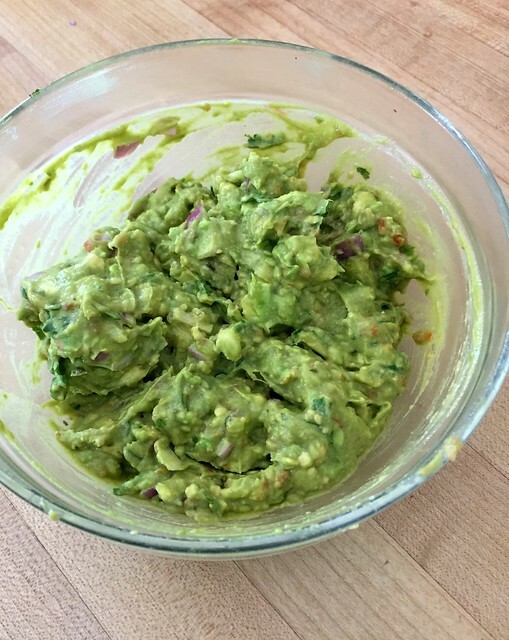 As I mentioned a couple months ago, we love the single-serving guacamole packs from Costco — but whenever I’m making food for a crowed (or even just a few guests) I always opt for a big bowl of homemade guacamole… and THIS is always the recipe I use! It’s so fast and easy, and if you use the simple tips I shared below, your guacamole SHOULD stay looking nice and fresh for several days. Mash avocados in a medium bowl (save the pits). Taste and add more lime, cilantro, garlic, salt and/or pepper as necessary. Eat immediately, or put guacamole mixture in a covered food storage container WITH a couple of the pits. 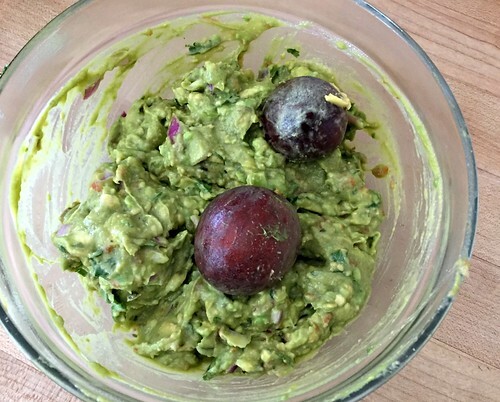 I specifically made the recipe easy to remember by using 4 small avocados and 1/4 c. of most of the ingredients — however, feel free to play with this recipe and add more or less, depending on your preferences! 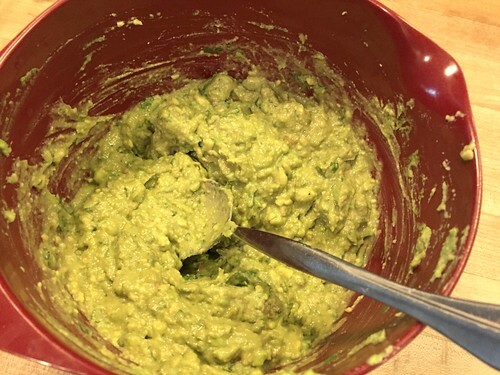 Over the past year, I learned that keeping the pits in the guacamole mixture will help the avocados retain their green color and not go brown as quickly (fun tip, huh!) 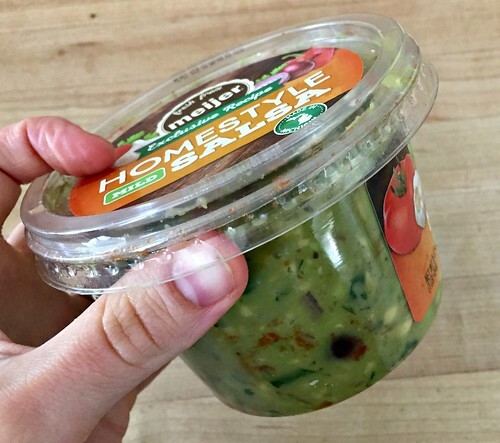 I’ve found that the fresh salsa contaiers from the deli department are a great size for storing guacamole — the lids fit nice and tight, and I often finish off the salsa when making guacamole, then dump all the guacamole back into the salsa container. Also, if you want to store your guacamole in a bowl, press plastic wrap directly over the surface of the guacamole so no air can touch the dip. Then, put a 2nd layer of plastic wrap over the entire bowl — this makes a HUGE difference in how long your guacamole will LOOK fresh. Let them sit on the counter until they are almost fully ripe (fairly soft when pressed) then put them in the fridge. They should keep in the fridge for several more days without getting over-ripe, like they would if you keep them out on the counter. 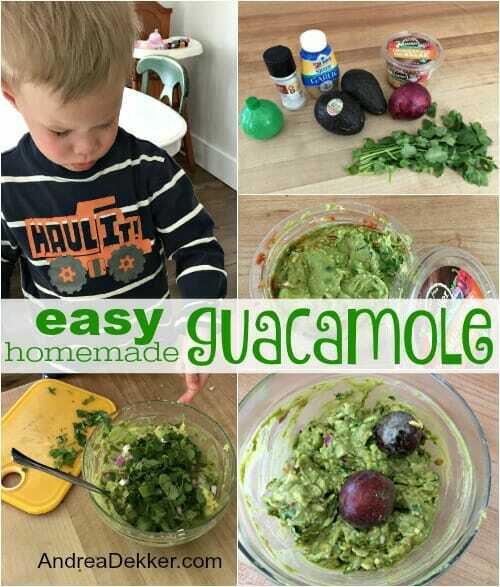 I’d like to try experimenting with different flavor combinations for my guacamole — but we’re finally to the point where all my kids will eat my guacamole so I don’t want to go messing with the recipe! 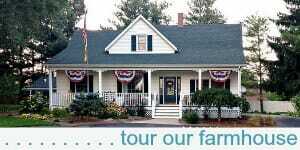 That said, I’d love to know if you have any good recipes for various flavors, spices, seasonings, etc. that you add into your guacamole! 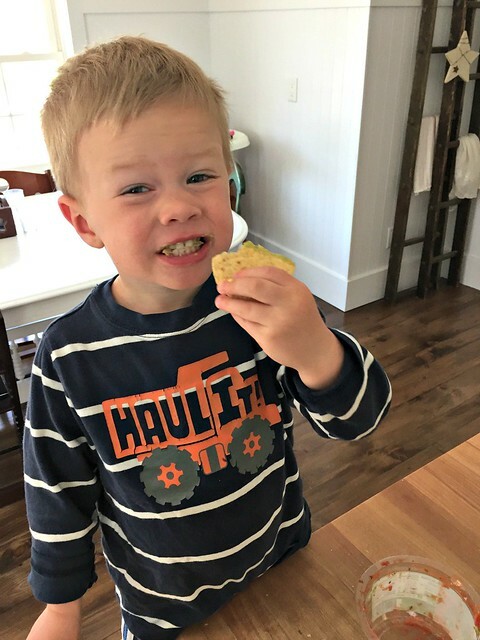 And as always, visit my virtual recipe box for more simple, delicious, family friendly recipes! My guacamole teacher was my husband’s niece’s husband’s mother- from Mexico!! 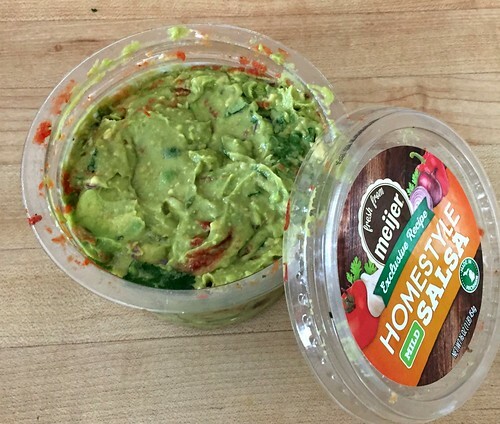 We mash avocados, add chopped tomato and chopped onion, a dash of hot pepper sauce, salt and pepper- stir together; then a good squeeze of lemon. If serving right away, stir the lemon juice in. If serving later, do the plastic wrap pressed down on the surface trick. 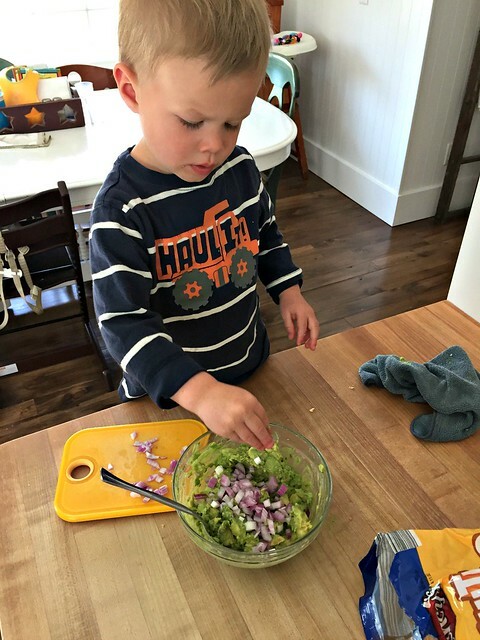 Garlic and cilantro are delicious BUT not in our guacamole! It’s intetesting to read how others do things! oh wow — I don’t know if I could make it without cilantro — that’s probably my favorite flavor in the guac! 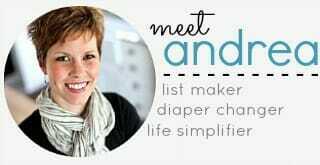 Thank you for the recipe, Andrea! I’m definitely sharing it on social media. 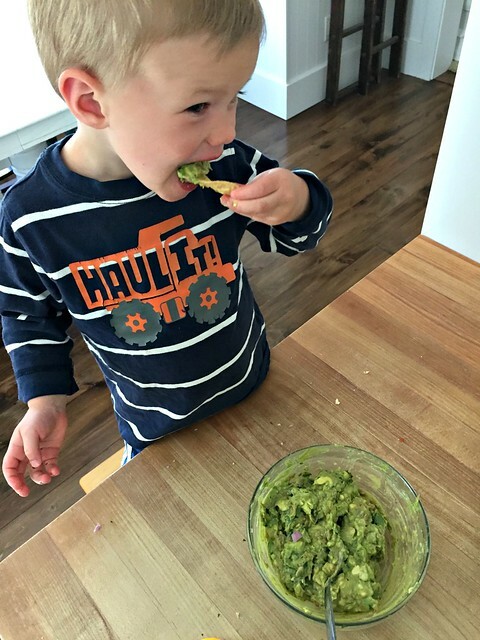 We love guac! I use somewhat the same recipe but loads of cilantro and no garlic. I eat it with eggs for breakfast by itself, or wrap it in a tortilla with my eggs for a breakfast burrito. If you like cumin, 1/2 tsp or so is a yummy addition. Another good add is some plain Greek yogurt (or sour cream). good call on the cumin! We usually add plain greek yogurt or sour cream as a “topping” for all our Mexican meals as well — so it sort of goes with the guac on our plates! I’ll have to try your 7-layer dip. It looks yummy! it’s super yummy and a great dish to bring when you’re going somewhere. It can easily be made in advance! 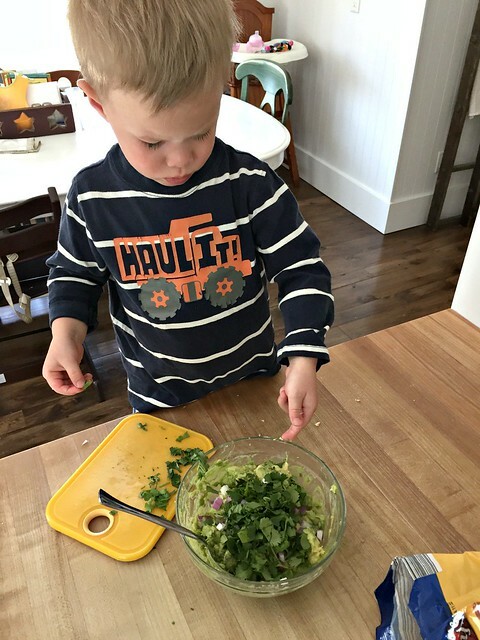 Our family loves a different (creamy – i.e., fattening LOL) type of guacamole. 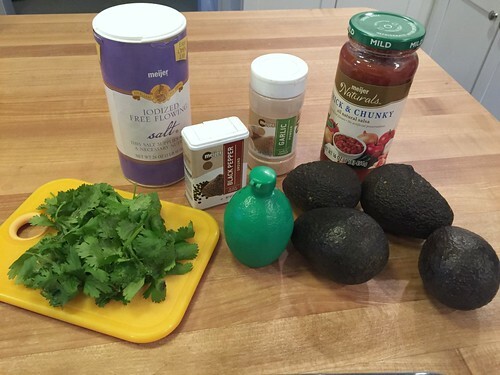 We take the mashed avocado, mayonnaise, garlic powder, cumin, salt, pepper, lime juice. Some of us like chopped up tomatoes in it. oh wow! I’m not a mayo fan, so that doesn’t appeal to me, but I’m sure it’s nice and creamy! I love avocado toast and will put a little bit of lemon juice in the mashed avocado. That prevents it from turning brown if I make it up ahead of time (sometimes it might get a little brown, but after I stir it up it isn’t noticeable.) Also, mashed avocado with some sun dried tomatoes, feta cheese crumbles and Trader Joes’ Chile Lime Seasoning is amazing. I think the lime juice has the same effect (which is why I add it to my guac all the time). And yes, avocado with sun dried tomatoes and feta is a great combo. I’ve never had the Trader Joes’ Chile Lime Seasoning, but it sounds yummy!